No doubt they are quite warm. 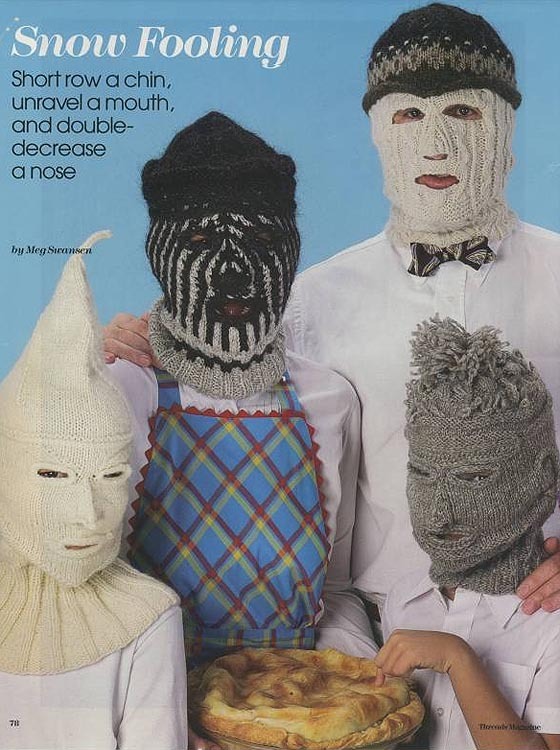 The book seems to be out of print, but I will discuss with my friends who knit things whether they can fashion something similar. This entry was posted on October 18, 2010 at 8:22 pm and is filed under Amusing tales. You can follow any responses to this entry through the RSS 2.0 feed. You can leave a response, or trackback from your own site. Not to degress from those fabulous head warmers…do you actually wear full headgear like that around the house. I can certainly see how it would help when you are sleeping and don’t want to burrow under the quits like a gerbil. However, I found an insanely efficient way of staying somewhat toasty on those nights you may want to watch TV. We found that the flat screen TV’s throw off a goodly amount of heat. I was really somewhat taken aback…and the larger the flat screen the more heat it emits. I was quite surprised. Nothing as extreme as those hats– usually just a plain watchcap for me (or the yeti hat). I like the klan one.